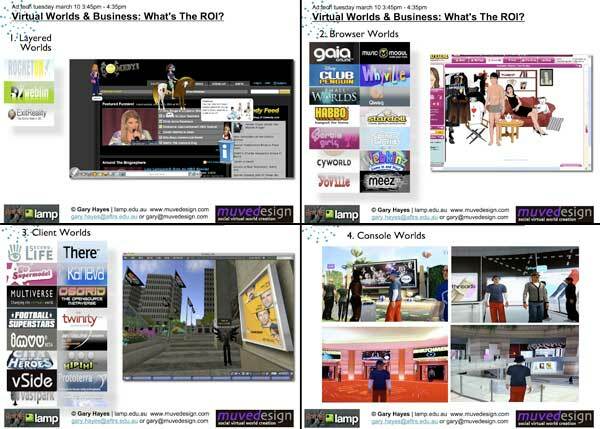 Virtual Worlds & Business: What’s The ROI? Below are my introduction slides from ad:tech 2009 earlier this week. It is such a short time (each panel is given 50 minutes) to cover such a vast area and myself, Jeff (habbo.com.au) and Mitch (SmallWorlds.com) were all struggling to impart tons of great info/examples and have enough time to get interactive. I hogged the first 15 minutes by giving a broad overview and some examples I have been involved in that fitted the brief of the talk. Below are my slides, a little descriptive text below that and at the bottom of this post some deeper insight into SmallWorlds (given most of my readers probably know Habbo already? – If not, Why Not!? ). I included one slide from Jeff Brookes set looking at Hitwise’s stats on browser worlds and other sites in terms of session length which will no doubt raise a few eyebrows! Virtual worlds are maturing at a rapid rate and brands are realising there are valuable business opportunities within them. Whether the objective is engagement, research or brand presence, virtual worlds are proving to be a legitimate marketing channel. In this session our panel will look to provide insights into the business benefits of working within a virtual world. View more presentations from Gary Hayes. I decided that a good ‘spine’ to hang the introduction on was the sort of negative questions floating around from those who don’t really understand what’s happening with web 3.0, the live virtual world space. This includes the paranoid printed press, a few out-of-touch businesses, and digital media companies/consultants more interested in iPhone/mobile games or Facebook widgets which is something they can truly explain (read: make money off). 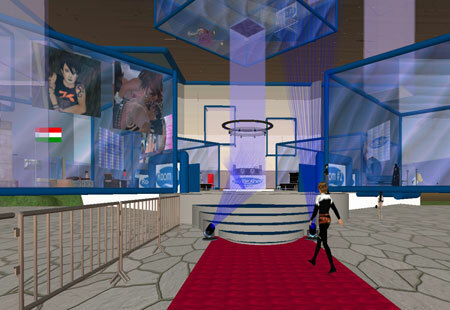 Virtual Worlds are on the decline? Thereâ€™s no one in them? & people donâ€™t spend long there? They are for kids or social â€˜gamesâ€™ not business? There are no marketing models? But I then addressed each question in turn showing real world stats and examples. Obviously in recession investment in new tech/services are going to be hit and recent reports do suggest a consolidation of investment into kids worlds, hinting at a lowering of VC in the ones I highlighted in my presentation, but this whole area is still something education & business are advised to R&D and understand fully – as a minimum. As we know it will be new ways of doing business, more immersive and efficient ways to collaborate and alternate forms of entertainment that will be partly what will bring us out of recession. I finished the talk with a quick overview of the main models that virtual worlds (and most online games) can be monetized. Items 1, 3 and 4 were picked up in a talk on the 2nd day of ad:tech looking at how Nike engaged with console ingame campaign experts Massive across a few platforms. They talk about the main traditional world features but then go onto the interesting areas of embeddable worlds (the Google Lively Killer app – not exploited), API integration with almost anything (twitter feeds, YouTube vids, FB updates on walls anyone) and the most interesting ‘missions’. You are encouraged to explore, meet folk, shop and basically get involved – Mitch says this is like the LinkedIn profile thinking, until your profile is 100% filled in you feel like you are missing out. I likened it much more like World of Warcraft, set players tasks, set them group tasks, give them rewards. This to me could be SmallWorlds real killer applet. At the moment they have around 400 000 users and that looks set to take off in the next months. NOTE: Based on my sticky post ‘The Brand Owners Guide to Joining the Metaverse“.